I, myself, am a Scottish born lass- through and through Scottish, and to be more specific an Aberdonian Quine. To say I've travelled around Scotland in the last eighteen years would be an understatement- its a favourite family holiday destination to go on hill walks, and I've recently made the big move from the Granite City to our diverse and enchanting capital Edinburgh. One of the main attractions of Scotland goes without saying - the beautiful scenery, a side effect of the vast amount of hills and glens that we have. In school, I took part in the Duke of Edinburgh Award's Scheme, to me this was the perfect opportunity to explore some of the hills that Scotland has to offer. With rucksacks packed with enough food and clothes for a 2, 3 or even 4 day adventure and with tents and stoves at hand, there is no better place to feel secluded and peaceful than in the Scottish highlands. Views that are truly unexplainable and just have to be seen await you once you take to the highland trails. I have been up hills in both rain and shine, in snow and scorching sun- sometimes both in the same trip!- but whatever the weather, the atmosphere in the hills, the stillness and serenity, remains the same and is something that everyone should experience. While this is one aspect of Scotland's romantic beauty, I thought I'd also focus on somewhere closer to me and that is Aberdeen. Despite having the nickname of the "Grey City", when the sun shines on the silver buildings, the city centre sparkles. With bunting strung from the buildings along the high street, adding a more colourful tone, walking down the mile long high street is a very pleasant walk. One of my favourite places to be in Aberdeen is the beach; the golden sands stretch out, offering an area to relax, to play and to enjoy (and occasionally ducking from seagulls). Walks along the shore, with the shells, sea glass and pebbles under foot is one of my favourite ways to spend the day. Ships are always to be seen dotted along the horizon, as are surfers taking advantage of the big waves that crash to shore. Whether it be on a warm day when the beach could rival that on the Spanish coastline, or a colder day when you can feel the fresh cool sea air at your face, the beach is a wonderful place to spend the day. Surrounding the city is so much nature. A favourite past time of mine is to go on a gentle forest walk, where you can see birds and animals in the trees and shrubs, and everything feels calm. Having both the River Dee and Don running through the city brings this wildlife close to everyone, something you can't escape. Our own Union Terrace Gardens, an area set aside in the the city centre to bring greenery and nature into the heart of the city, is an expansive grassy area which is pleasant to both sit and relax or walk around in. Not to mention the abundance of parks in both the inner and outer city where you can hear the shrills of laughter and screams of delight from children, or find a more peaceful and secluded area, where the nature encompasses you. Furthermore, Edinburgh- a city which I have visited and dreamt of living in, and now am. Its a city which is very culture inclusive and diverse, you meet all types of people from different walks of life here. The University, an area which I spend a lot of time in, is housed in old and elegantly built buildings. While I can explain in detail where the student scene is, I can also appreciate the beautiful architecture in the city itself, with so much history surrounding it. Sitting in Princess Street gardens and hearing the one o'clock cannon going off, or (even better) being in the castle itself when the cannon is released, reminds you of the long story associated with Scotland's capital. Walking down some of the many streets that lead off of our main street, and you reach smaller, very cute, little residential areas where charity and vintage shops adorn the roads, and cafes invite you in. Edinburgh is very much a city that benefits from exploring by foot, of which I have done a lot of being a student without a car, that way you can look at the buildings, and view the sky line. Arthur's Seat, a famous myth ridden hill, is a must see when in Edinburgh, the walk to the top, and the views that it gives you- spanning from the city centre and Holyrood, to the Fourth Rail Bridge, to the sea- are outstanding. Edinburgh is full of romantic possibility, and strolls down the winding streets and close offer an escape. When in Edinburgh, you can truly understand why it is our capital. I've written this post as a entry to a competition held by Sykes Cottages. Find out more about how you can enter here, on their blog and follow them on twitter @SykesCottages. 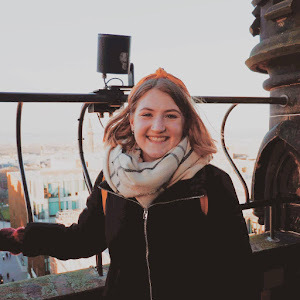 I now nominate three blogs which I have become addicted to- fellow Scots who have beautiful lifestyle and travelling blogs that really showcase the romantic appeal of Scotland. Buteitful Bute, whose travels around Scotland have made me want to take the opportunity to head over to see more of the West Coast. Scottish Outlander, who posts absolutely stunning photos which really illustrate the beauty that lies in Scotland. Edinburgh Etiquette whom I gain inspiration of places to visit in none other than Edinburgh. Let me know of what you think about Scotland's appeal down in the comments below, I'm always one who loves to hear about new places to visit.